TVS Apache RTR 160 4V price in Mumbai starts from Rs. 82,051 (Ex-showroom). Apache RTR 160 4V is available in only 6 variant. 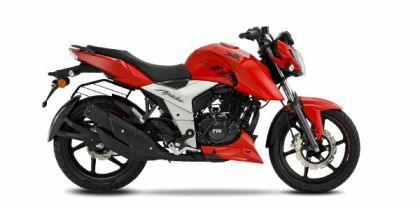 TVS Apache RTR 160 4V Carburetor Dual Disc is priced at Rs. 85,051 and the top-end variant TVS Apache RTR 160 4V Fi ABS is priced at Rs. 99,133. TVS Apache RTR 160 4V's top competitors are Bajaj Pulsar 150 (price starting at Rs. 65,446 in Mumbai) and TVS Apache RTR 160 (price starting at Rs. 76,635 in Mumbai). Q. Is it possible to install ABS to 160 4v? You can contact the authorized service center for this concern as they are the best person to provide to the correct option. Q. How is the road grip, maintenance and mileage? Q. Which bike is best between Apache 4V 160 and Pulsar 160 in terms of price and performance? Q. What is the average maintenance cost on this bike and will it be comfortable for a rider of 5 feet 10 inches? Q. What is actual mileage & maintenance cost?